Ask fellow campers about "Carver's Cove" and nearby attractions. First the pros: very nice dock on the Banana River for fishing or sitting; location is convenient to restaurants, Cocoa Beach, Cape Canaveral; friendly and accommodating hosts; nice laundry at $1.75 each for use. 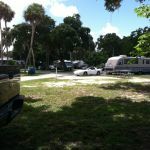 Cons: most of the sites are occupied by long-term/permanent rv's; dirt road that is occasionally grated but has a lot of pot holes; park is older, not really kept up well and looks old. In our opinion, very over-priced and you are paying for the location. Would not stay here again. We camped at Carver's Cove in a Fifth Wheel. Very peaceful, small campground but each campsite was a good size. Beautiful sunsets from the camp's pier. Hosts were very helpful and attentive. Lots to do in the area so did not miss other amenities like swimming pool, gym or games areas. Will stay again when we are next in the area. We camped at Carver's Cove in a Motorhome. Kennedy Space Center is a must. Lots of good birding in the area. Beach and ocean are just a few blocks away. Are you affiliated with Carver's Cove ?